Established in 1998, Torrance, CA based Backspin Entertainment is a boutique and an award-winning mobile DJ enterprise that has been proudly serving the Greater Los Angeles area for over 15 years. 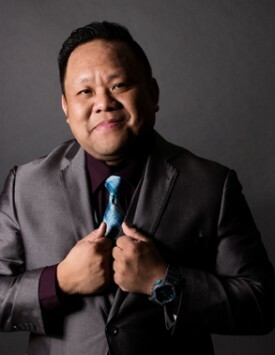 At the helm is yours truly, Sherwin Ruste (pronounced “Rusty”), who has built Backspin Entertainment on years of providing really awesome experiences for rock star clients like you! It all began with playing with my parents’ old hi-fi record player and stereo system as a young boy. At the age of 15, I started DJing at house parties with nothing more than two boom boxes with tape decks and switching back and forth thinking it was the greatest mixing skill ever. Over the years, I realized that rocking a dance floor was something that I had a natural talent for–but more importantly, it became a passion. During my senior year in high school and early college days, I saved my money and bought my first pair of Technics turntables and a mixer—this process would not be complete if I didn’t start a record collection—and so I did! I spun at more and more parties and in 1998, Backspin Entertainment was born and the rest is history. One of the many things that my clients benefit from is my 9 years of client-service experience in the digital marketing space. I have worked with Fortune 500 clients such as Yahoo! and Microsoft as well as with wedding and fashion retailers like David’s Bridal and Nordstrom so I understand what it truly means to be a professional, client-service oriented enterprise. I can go on and on about enormous multi-genre music libraries, awesome light shows and booming sound systems, but let’s face it, while all of that is essential to any event, the most important thing for me is to help you create a memorable experience and bring your vision to life. I’m also bilingual and speak fluent English and Tagalog. I pride myself in being musically dynamic and versatile which makes me a great open format DJ. Being able to deliver the overwhelming effect of music is my greatest pleasure and expertise. My satisfied clients say it best here. The types of events that we rock, but not limited to, are corporate events, school events, celebrations/ social events, nightlife, but most of all–we LOVE rocking WEDDINGS! Please give us a shout and find out the cool things that we can do for you. Tell me about your event—what you like—what you don’t like—your vision. I look forward to hearing from you very soon.